Truffle Toes, a Musher who appears in the comic Mutiny on the Fungi. Mushers, also known as the Mushroom People or simply Mushrooms, are a species of Super Mushroom-esque creatures that appear in the Nintendo Comics System comics. Like many denizens of the Mushroom Kingdom, some Mushers serve King Koopa, whereas others are friendly to the kingdom and serve the Mushroom King. They slightly resemble Toads, but are even more mushroom-like, being essentially Super Mushrooms with arms and feet. Most Mushers speak in slightly broken English, often using the least number of words possible to get their point across. 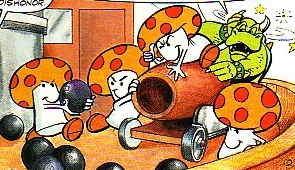 Mushers make a prominent appearance in the comic Mutiny on the Fungi, in which they make up the majority of Captain Koopa's crew on his airship. One Musher in particular, named Truffle Toes, is a major character in the comic's plot. Captain Koopa also orders a group of Mushers to attack Mario with cannons when he tries to escape the ship. Mushers are later shown trying to assist the Mushroom King, who has been turned into a dog. A single Musher makes a small appearance in Koopa's Health and Beauty Tips as the one that Koopa is offering his tips to. Mushers also make a brief appearance in Bowser Knows Best as palace guards for Mushroom Castle. This page was last edited on November 27, 2018, at 07:20.